Drake Homes Inc. established its mark as a Houston area home builder in 2001, specializing in affordable and conveniently located homes. 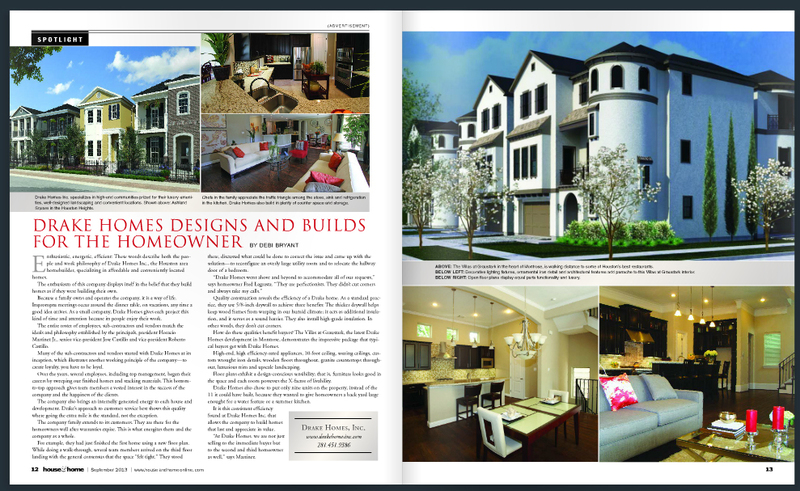 Drake Homes Inc. created a signature as a well known home builder inside the Houston inner loop, building numerous in-town homes. Drake Homes Inc. has also built homes in the suburbs, such as The Woodlands and has also been a participant in construction operations in Florida. Drake Homes Inc. develops a rapport with clients and homeowners so that they can be of assistance before, during, and after the purchase of their and your dream home. The family owned company makes it their mission to provide the highest degree of respect and attention to each home buyer. That mission was ingrained early on in the principles’ work ethic. Drake Homes’ President, Horacio Martinez Jr., began his home building career in customer service. With over 35 years of building experience between the Drake Homes’ executive team, meticulous care is taken with each development and each house to ensure the highest level of expectations are met. Ten-foot ceilings, eight-foot doors, livable floor plans, and a stellar work ethic are all hallmarks of a Drake Homes. Our motto: Drake Homes Inc., where we make dreams come true. Availability and prices of any home mentioned in this web site are subject to change without notice. The materials provided on this web site and server are intended for informational purposes only and are not intended to constitute an offer or solicitation. Despite the efforts of Drake Homes Inc to provide accurate information, it is not possible to ensure that all information is constantly correct. The materials contained on this web site and server could include technical inaccuracies or typographical errors. Drake Homes Inc assumes no responsibility for any actions taken as a result of using this web site and server, or for errors or omissions in the materials on this web site and server.